So, you’ve decided that you are ready to buy a home, whether it’s your first home, or you’ve been at this for a few years, there is always important information to know. Keep reading to see our best tips for the buying process! It’s so important to know how much you can afford, what your down payment will be and how to budget for it, what monthly mortgage payment is most reasonable based on how much you are able to pay every month, as well as what type of loan program you’ll be using to finance the property. When it comes to finding a mortgage, you have several options such as going to a mortgage broker, using an individual bank, or searching online. Make sure you research all of them to see what works best for you. It’s a good idea to have a personalized strategy session with a trusted mortgagee professional so you can address all your initial concerns and make sure you are all on the same page moving forward. It is also helpful to go over any potential challenges that may arise throughout the entire transaction so you are prepared for it. Getting pre-approved by a lender or mortgage brokers can expedite the closing of your purchase, a process that could potentially take months to do. While there isn’t a universal credit cutoff line for purchasing a home, it’s still important to have a good credit score. The better your credit is, the easier it will be to secure a good loan with low interest rates. Once you know how much you can afford, shop around for a lender to receive the best rate. Even the smallest difference in mortgage rates can make a big difference in the long run. Once the home is yours, your mortgage will be your greatest expense but it’s not your only expense. It is essential to make sure you are purchasing a home you can afford because you also must pay for your homeowner’s insurance, utilities, and property taxes monthly. One way to reduce how much you are paying each month is to put 20% down when you purchase it. If you put down anything under 20%, you will have to pay for PMI, Private Mortgage Insurance, which is a safety net for the bank in case you fail to make your payments. Typically, PMI adds about 0.5% of the total loan amount to your mortgage payments for the year. While saving up for a bigger down payment can be difficult, you’ll be much better positioned in the long run. *** Financial Tip: As for monthly payments, a good rule of thumb is to make sure that the total monthly payment doesn’t consume more than 36% of your take home pay. Once you’ve considered the down payment, make sure you’ve got enough to cover fees and closing costs. These may include the appraisal fee, loan fees, attorney fees, inspection fees as well as the cost of a title search. They can easily add up to $10,000 and if you the amount you have saved doesn’t cover all of it, then you have several options to consider. If you are a first-time homebuyer, you can withdraw up to $10,000 without penalty from an Individual Retirement Account, if you have one. If you do this you must pay taxes on the amount. Another option is to check on whether or not your employer can help you. Sometimes big companies will chip in on the down payment or help you get a low-interest loan from selected lenders. Your home is one of your largest financial assets and when you decide to buy or sell your home, you are investing in your future. With that said, you are going to need an experienced and knowledgeable professional to guide you through the process and help you receive the best possible outcome. 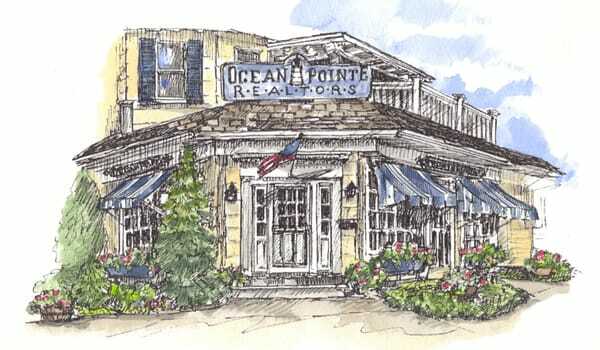 In southern Monmouth County, there is no brokerage more qualified than Ocean Pointe to make your goals a reality. Located in the heart of Sea Girt, Ocean Pointe gives you the local presence you need as well as the world-class capabilities you deserve. We know the ins and outs of our local markets better than anyone else in the area and we have deep roots in our community, which is reflected in the way we do business. Our staff is available whenever you need them. Collectively, owners Joe Riordan and Bart Dennin have over fifty-five years of experience marketing local real estate. Each of us is held to the same high standard of excellence and professionalism as our owners and we combine hard work, honestly and integrity with personal service. Picking a house to make your new home is certainly not easy because there are so many factors to take into consideration such as is this where you want to retire? Could you see yourself raising your children here? Is the backyard big enough for summer BBQs? And the list goes on and on. Square footage, beds/baths, neighborhoods, schools, etc. If a house fits all your needs but has horrendous floral wallpaper, ignore it. Cosmetic changes are easily fixed but not every home is going to have all your wants/needs so don’t pass it up based on something can be changed in a pinch! Are there any upgrades you can make over to increase the value of the home? Do you plan on renting out this home in the future? If so, consider the current rental market in the neighborhood. *** Financial Tip: Aim for a home that costs around two-and-a-half times your gross annual salary. Buying a home is an emotional process because once you fall in love with a home, you start to see your life there. You may see your children growing up and playing in the backyard, or maybe you see dinner parties in the huge dining room and Christmas mornings by the fireplace in the living room. Once a house sells you, it’s time for you to put in an offer but there is one thing to keep in mind: Stay Rational. A lot of people get so caught up in a bidding war that they end up offering much more than they can afford, all because they love the house so much. If the seller accepts your offer, you will enter contract before closing, and it’s just matter of waiting for final mortgage approval, appraisal, inspections and other requirements which would be spelled out in the terms of the contract. The last thing you want is to close a sale on a home, only to move in and find out a week later that it needs major repairs ASAP. Make it clear to the seller that your offer is contingent on passing inspection. Hire a reputable home inspector to identify any required repairs or safety issues. If anything comes up during the inspection, negotiate with the seller to either drop the price or pay for the repairs. Don’t be afraid to back out of the deal if the seller isn’t willing to fix the issues. Remember you are spending a great deal of money on a home, so make sure it is worth it. Through the process of purchasing a home, you will have so many questions which is where having a lender comes in. Having an experienced and responsive mortgage banker assist you can make the process much easier. For example, every home buyer has their own priorities when choosing a mortgage. One may be interested in keeping their monthly payments as low as possible while another is interested in making sure that their monthly payments never increase. A banker can help you decide which works best for you and ensure that all your needs are met. The next step is to have your lender arrange for an appraiser to provide an independent estimate of the value of the house you are buying. The appraiser is a member of a third-party company and is not directly associated with the lender. The appraisal will let all the parties involved know that you are paying a fair price for the home. At closing, you will sign all the paperwork required to complete the purchase, including your loan documents. It usually takes a few days for your loan to be funded after the paperwork is returned to the lender but after the check is delivered to the seller, you will be ready to go!